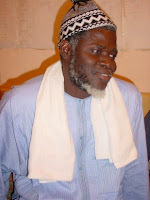 at-turuqu ila 'Llahi ka-nufusi bani Adam: The ways to God are as numerous as the children of Adam. For everyone there is a direction towards which one turns. In the Series: In Quest of My Oasis at Technology of the Heart our intentions is to engage with contemporary wayfarers and seekers who are drawn by the irresistible yearning for the Real, pulled by almost like a magnetic attraction to embark on the Quest and are guided along the Path. We hope to know them, connect with them, share their inspiring journey in the spirit of what sufis call Sohbet. In this 8th Episode of the Series our guest is Sheikha Maryam Kabeer Faye, acclaimed author of her Spiritual Autobiography, Journey Through Ten Thousand Veils (2009, Tughra Books). About her Book Sufi News and World Report commented, "It should be on the must read list for anyone interested in following the Sufi path and especially for women aspirants." 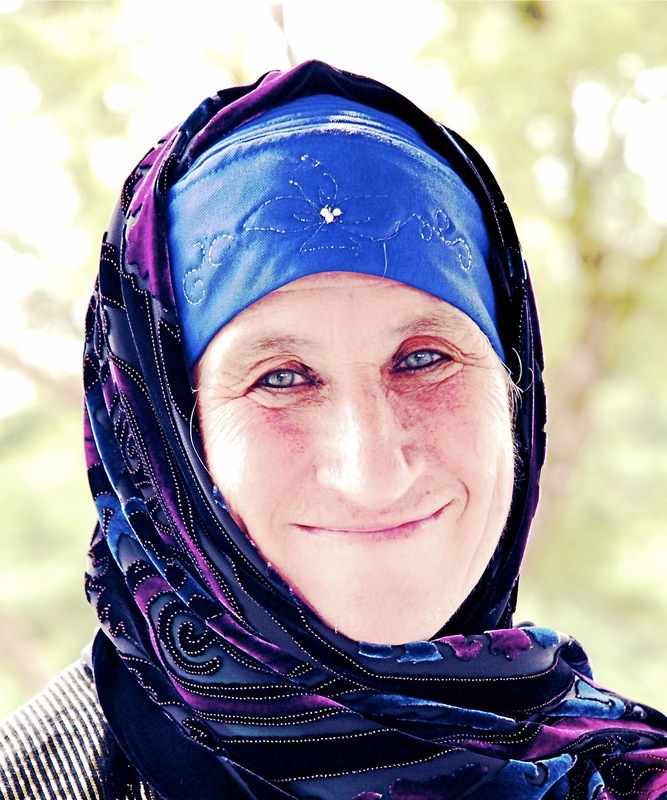 Sheikha Maryam is an authorized Sufi Guide, Qur'an Instructor and Wayfarer in the lineage of Mustafawiyya Sufi Order. The Sohbet here revolves around her life, the extra-ordinary journey she was guided to take as it continuously unfolds, her Book and realizations along the Path. Hope you will enjoy it and by the Gift of the Most Generous Giver - you will receive something valuable from it. Within the interview, she has left footprints of precious advices and subtle guidance which could be useful to any seekers whether novice or advanced. 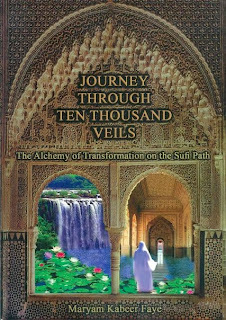 Sadiq Alam: Your book, Journey Through Ten Thousand Veils has received numerous praises from different fronts. Please tell us about how the inspiration for the book came about and was there any particular event that planted the seed to write this special book about your personal journey? 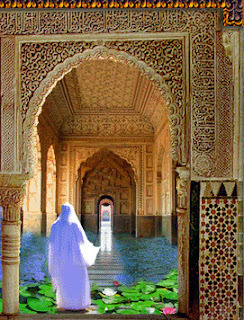 Sheikha Maryam Kabeer Faye: There was not one special seed or event, but an abundance of seeds, a continuous stream of seeds or events, (that were planted in the earth, by the blessing of the Lord of Infinite Grace and watered by the rain of grace), which, inevitably, rose up out of the soil and bloomed. The blooming of every seed was a sign of Allah’s grace illuminating the way. The journey of a thousand steps (states and stations) is composed of all of these states of realization. The writing of the book was another dimension in the unfolding journey, linked by the Grace of Allah (swt) to every other step along the way. Neither did I follow a map as I traveled or any kind of manual of style as I wrote. I watched the words fall like rain on the page, just as I witnessed the signs of Allah manifesting within and around me as I traveled - the continuously unfolding signs, which were revealing the way that leads to Him. I was inspired and impelled to write this book – not by a single event or catalyst - but by the collective mass of experiences – the countless unfolding signs. From the time that I could write, I began to write about this, or make paintings to express the amazing perceptions that were arising. Recently while teaching a class of children I remembered an image I painted repeatedly when I was a child. It was of a girl standing in a garden with arms stretched upward. There was a huge eye in the sky from which tears were falling into the garden causing flowers to rise up in bloom. This was one of the earliest images which came through indicating the state of perception that was continuously unfolding. At some moment in the course of receiving so many blessings and gifts, I began to record the words that would become this book. This organic process continued throughout the journey until the book was published (by the excellent people at Tughra Books) and the book inevitably had to be ended, while the journey continued, bringing forth material for other books, seeds that would grow into other trees. I do not believe that I am uniquely blessed, but that every creation of Allah is thus standing in the rain of His grace, needing only to wake up, rise up, and become conscious of the blessings that are descending, grateful for every moment in the process of the awakening. Your journey is quite unique as all of ours are, but Allah has honored some of the journeys over others by enriching them in rewarding their intention and sincerity. Looking back to the earlier days of your spiritual adventure, what single gift from Allah do you cherish the most? 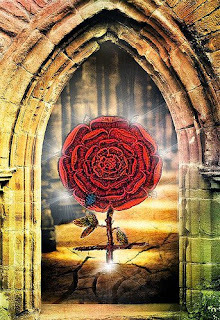 Sheikha: The greatest gift was the realization of His Presence with and within me – that He, the One of Infinite Grace and Light and Love, the One of Boundless Knowledge and Might – was with me, inspiring and guiding me. This is the gift of deepest significance then, and now, at every moment of my life. To be conscious that He is with us, sustaining and bestowing guidance upon us, at every moment, in every situation, is the greatest gift because it is our direct link to His Living Presence. Before you even embarked on your journey, there was an element of deep spirituality within you, which couldn't be found outside, there was no reflection of it in daily or social life. In today's world those who find themselves in similar condition as you were in your earlier days, who feel the nearness of God but are unable to talk about it, learn or hear about it, not able to acknowledge the deepest reality that a human being can experience - for them what would be your guideline, both on personal level and also how we can address this as a society? Sheikha: In reality, although no one was speaking about God, the signs of Allah were continuously manifesting around me and within me, definitively guiding the seeker of Truth toward the Goal. We are being informed and guided, as Allah (swt) tells us in the Holy Qur’an: “We will show them Our Signs, in the horizons and in their own selves, until it becomes manifest that it is the truth” (Holy Qur'an 41:53). Every one of us - living and breathing, hearing and seeing – is a witness to the signs of Allah’s undeniable existence. My advice to every seeker of Truth everywhere is to open the eyes of your heart and soul and behold Allah’s signs. They are manifesting continuously, both within and without. Even those things, which are most difficult to behold, almost incomprehensible, as we witness them in the world today, can be comprehended in the light of Divine Revelation. Everything that we could possibly see unfolding has already been explained in the Qur’an. What we need to do is seek for the true understanding of the ayats (signs) in the Qur’an and then look through that lens at the events which are also signs (ayats) that are unfolding in the world. That is the outer dimension of our challenge. On the personal, interior level, may we behold the signs within ourselves in the secret domain of our hearts and souls, in which only Allah, our Beloved Guide, knows what we are saying and what we are seeing. He is with us at all times witnessing our state of being and knowing, as we are witnessing what He is revealing to us. My advice to the seeker of Truth is to come to realize the Presence of the Divine Guide within and to pay attention, with deep love and longing for deeper and deeper knowledge of what is being revealed. As we are in the midst of receiving the boundless gifts of that which is being revealed, we have a choice to make and a role to play. We need to develop the discernment (furqan) to know the difference between what is good within us – the gold – and what is dense like lead, needing to be purified and transformed, or simply released. Further, once we realize that we must be transformed, the alchemy of our transformation on the journey to our Beloved Lord is fueled by the power of du’a, (our prayer and supplication). So, as we continue to make the ever-deepening journey, may we deeply and consistently intend and ask for what we truly need and then behold that our Lord Most Merciful, Who has inspired us to pray, is answering our prayers in the most profound way possible. As for society that you mention in your question, I believe that the world we live in is transformed person by person, two by two, three by three, transformed more by evolution than by revolution. The more that we receive and share the knowledge of God, the more we, and those we are sharing with become conscious inhabitants of the divinely inspired universe. You were born in a Jewish family. Obviously Jewish, Christian and Muslim people share a common history and trace back their common lineage to Prophet Abraham, peace be upon him. After embracing Islam and looking back to Judaism, what do you appreciate the most about the Jewish faith from an Islamic perspective? Subconsciously, subliminally, I was seeking the path followed by the Prophets (a.s) but I could not find it manifesting clearly anywhere in the contemporary world in which I lived. And that is why I set out on the journey, leaving the contemporary consumer world, in search of ancient truths. I never followed a map, but was guided (The traveler is a leaf blown by the wind of the Divine Will) first to the India and Nepal, then to live in Christian monasteries, and then, to Jerusalem where, in El Khalil (Hebron) the place of Abraham (a.s.), I met my first Sufi Master, Sheikh Ab’dul Muttalib (ra), and, absolutely naturally, and inevitably, embraced Islam. According to what was revealed to me, there was no way that I could fulfill my Jewish heritage except by accepting the continuity of the prophetic line through Jesus (a.s) to Muhammad (saw). Alhamdulillahi Rabbil’alamin! Say ye: "We believe in Allah, and the revelation given to us, and to Abraham, Isma'il, Isaac, Jacob, and the Tribes, and that given to Moses and Jesus, and that given to (all) prophets from their Lord: We make no difference between one and another of them: And we bow to Allah (in submission)." The realization that all the Prophets and Messengers (a.s.) were sent to humanity by one God, that they were all part of one fellowship, and that we, as creations of the one Creator, must accept them all, was so absolutely simple, pure, and true, I am very much amazed that so many members of the human family do not seem to realize the unity and integrity of this plan. There are many reasons that people of the path cite as to the necessity of a guide in the spiritual path. From your personal experience what would you say regarding the need of a Teacher for seeker? Especially from a westerner's perspective for whom the idea of submission to a teacher sounds almost like a cult. Sheikha: True Guidance is the path of liberation from all forms of hypnotism, mesmerism and intoxication such as might manifest in a cult. The leader of a cult controls the minds of his followers with his will and personal force to do what he wants. A true divinely inspired guide, who has been given the permission to teach, leads those who follow his guidance to do what Allah (swt) wants. The transmission that he (or she) carries in his hand and distributes, as Allah wills, emanates directly from the Divine Source. We have only two real choices in this life ( the journey in this world which leads us through the barzakh to the next world) : to do what Allah (swt) wishes us to do – to follow the Straight Path which leads directly to Him or to follow any other path or direction. In considering this choice and its implications, let us consider what we would do if we were living in the time and in the vicinity of the Prophet Abraham, Noah, Lot, Jesus , Muhammad (saw), or any other of the Prophets and Messengers (a.s.) Would we hear and obey what the representative of Allah (swt) was teaching us to do, or follow the example of everyone else who was not following the messages delivered? The Message from our Beloved Lord (swt) is eternally true, now, as it was in the time of every one of the Prophets and Messengers (a.s.) But since Muhammad (saw) was the last and seal of the Prophets (a.s.) we cannot receive this transmission from a Prophet after him, but from a teacher, a guide, who has the permission to pass on the prophetic transmission – to make real and undeniable for us in our time- what they transmitted in the time in which they lived. If we lived in the time and in the presence of any one of the Prophets (a.s.) would we not truly want to follow the teaching sent to humanity through the Prophet (a.s.) by Allah, the Master of Guidance. This teaching must be transmitted in every age, and this is the reason that we need a true teacher through whom this teaching will be transmitted. If we are not guided by a true teacher, who is thus transmitting the eternally revealed truth, we will be following our own nafs (desires), the voice of shaitan and the collective voices of the unbelieving inhabitants in the dunya, which manifest in every age as they did for example in the time of Noah (a.s.), impelling the majority of the people not to get into the ark. Furthermore, while each of the Prophets (a.s.) was sent to a specific group of people, the Prophet Muhammad (saw) was sent as mercy (rahmat) to all the worlds. And it is the light of Muhammad (saw) (Nur Muhammadiyyah) that inspires and illuminates all true teachers. This is the liberating light of Divine Truth, the opposite of the mind control and hypnotism imposed by the leaders of cults, who, in one way or another, lead their disciples to drink poison and end in hopelessness and in a state of utter loss. In order that we may not fall into a state of loss, but be enabled to rise, we need a true teacher who will guide on the path of true faith, knowledge, and service, one who has completed the journey and been given permission to guide others to completion. You have met a number of Teachers / Guides in your journey. Among them who influenced you the most and in what way? Please share something about your guide, Sheikh Harun Rashid Faye, may Allah preserve him, which you believe would benefit the readers. Sheikha: I would like to respond to this question by expressing my profound gratitude to Allah (swt), the Master of Guidance, the Guide, for every step made in the journey that leads from Him to Him, I was a leaf carried by the wind of His will, I did not determine who I would meet or where I would go, nor what stages of transformation were to be experienced. 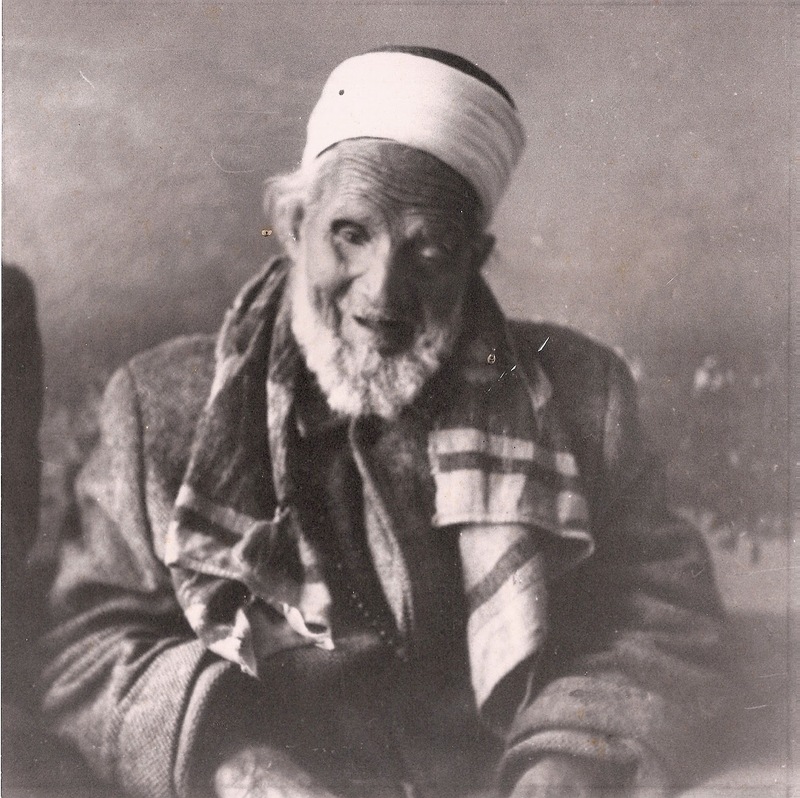 When I first heard about my first Sheikh, Sheikh Abdul Muttalib (ra) I was told by his grandson, Hassan al Sharif, in Jerusalem, that his grandfather was waiting for me in El Khalil (Hebron). When I met this ancient man and then experienced what happened to me, fis-sabillilah and then what happened through me as a result of this meeting, (the holy time spent with him), I came to understand better what it meant that he was waiting for me. I was then, by the grace and the hand of Allah (swt) guided to Sheikh Bawa Muhaiyadeen (ra) and his community in Philadelphia and Sri Lanka. 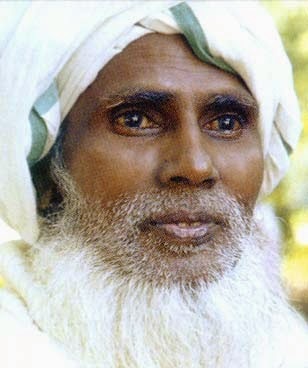 I remained with him, receiving a wealth of guidance in his presence until he left this world in 1986. I continued to receive much blessing and knowledge in his presence after he left this world. Still, I felt the need for more training, transformation, and development and was guided to Senegal, West Africa and the Muridiyya Tariqat founded by Sheikh Ahmadu Bamba (ra) transmitted to me through the hands of Sheikh Abdoulaye Dieye (ra) and Sheikh Aly N’Daw. 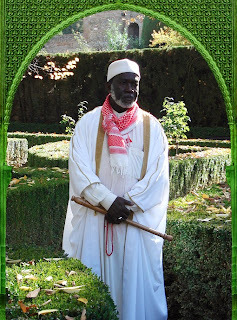 By Sheikh Dieye (ra) I was given the mantle and made a Sheikha in this blessed tariqat. Thus did the journey to Allah, the ever-deepening experience of the transmission of Divine Knowledge and the beautiful din continue, within my life, to unfold. I cannot describe in the context of this interview how deeply meaningful are the unfolding stages of the journey, how blessed I feel to have received each of the divine gifts and how much I feel that I must serve, as those who imparted to me knowledge of the Divine, served. In order that I may serve, I have been purified, transformed and trained extensively by the hand of Sheikh Harun to journey through more than fifty khalwahs (guided retreats) through which I became a Sheikha bearing the green mantle in this blessed Tariqat, Alhamdu lillahi Rabbil’alamin. Through this, I received the mandate to serve. What I perceived on the outside was, as it always is, a mirror of what was coalescing within me. I had thus arrived in the realm, or station, in which I saw the beautiful teachings of the Qur’an,the teachings sent to us by our Creator Most Loving, Most Kind, manifesting before and within me. Every step I had taken in the journey led finally to this unfolding state of awareness. In what place or station had Allah willed the traveler to arrive? It is a station in which, one by one, the words and teachings of the Holy Qur’an and other Scriptures become alive. It was this awareness arising within me that made realize the special nature of the place to which I had come. 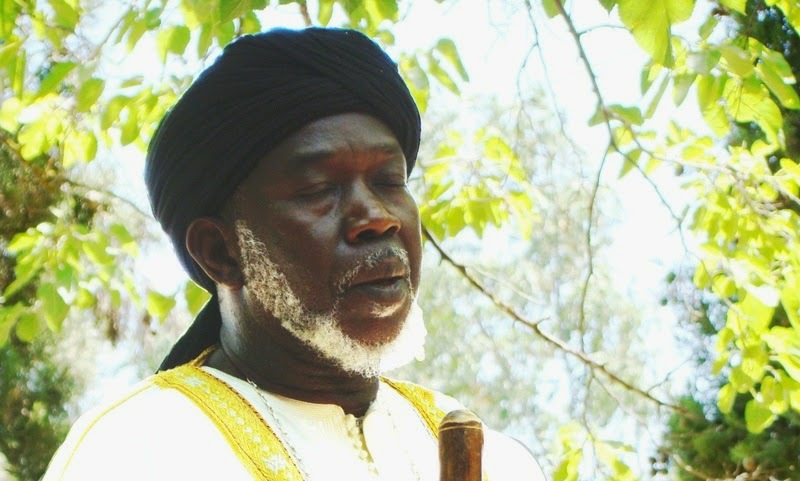 This teaching was being transmitted by Sheikh Harun both internally, specifically as he guided me through a series of deeply guided retreats, referred to as halwah, and externally, in the sense that I was able to perceive these living truths in the actions and activities of the Sheikh, and the ever-expanding circle of those that he was training. Shortly after I met him, I saw the Sheikh in a dream. He was standing in the center of a brilliant swirling vortex of light. I was able to see, fading in and out of that vortex of light, the forms of his students - his companions, all the lives that he was inspiring and empowering. Later I saw Sheikh Harun standing in a parking lot surrounded by the fuqara, his circle of students. He was wearing a white robe and a red kufi (prayer hat), whereas in the dream, he had been wearing a white robe and a red turban. From this moment on, I saw, powerfully manifesting in life what I had seen in the epiphany of the dream. 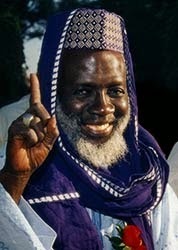 I witnessed the Sheikh as the catalyst, galvanizing the circle, by the power of Allah and the blessings of the Prophet (saw) manifesting through him, igniting the souls of all those surrounding him, so that each one of his students was inspired and energized to make the real journey and, station by station, proceed to accomplish what he or she was created to do. I could see that the Sheikh was not appearing as a figure-head, an idol to be worshiped by those following him, or a distant venerated figure that the disciples were lucky even, rarely, to see. He was manifesting as light of guidance within them, an extremely vital element in their lives and spiritual journey, a powerful catalyst activating their transformation and elevation. Such a noble, humble, and empowered teacher, one authorized by the Divine to teach the deepest truths, is not looking for disciples, but for companions. He does not want to imprison his companions for life, but to set everyone free. The disciples are not to remain disciples for life, but every capable person is trained to become a Sheikh or Sheikha, who will then continue to catalyze and transform others. The amazing tool that the Sheikh wields by the power of Allah, the instrument of transformation, is divine knowledge made manifest in action. The Sheikh teaches by example, and the example that he, himself, embodies, is one that profoundly follows the example set by the Messenger of Allah (saw). Much of the Qur’an was revealed in the context of what exactly was taking place in the lives of the Prophet (saw) and his Companions (as). From this we learn that the wisdom revealed to us by our Creator is not abstract, but can and should be applied to all the dimensions of our life in this world. This is the kind of profound practical teaching we gain as we travel inwardly and outwardly with such a Sheikh. Living and studying with such a teacher is a deep and dynamic way of coming to understand the real meaning of the Message of God and how it impacts upon human beings who are truly open and surrendered to it. Shortly after I made the bayat (affirmed allegiance to the Creator, by the light of the Prophet (saw) through allegiance to the Sheikh, in the language of the Quran Verily, those who give thee their allegiance, they give it but to Allah Himself. [Fath 48:10]) I was standing in line with the Sheikh at Rite Aid. Behind us was a young woman in a wheel chair, handicapped, both physically and mentally. His first impulse was to put her before us, then he paid her bill, and then he put money in her hand. I came to see, as time went on, that this is how he always acts. To be profoundly inclined to goodness, kindness and charity for the sake of God, Who is Most Loving and Kind, is the sunnah of the Prophet (saw), divine knowledge manifested continuously in action. It is the way that, in any situation, the prophets (as) - those who are representatives of God on earth - would have acted; it is the way that most purely and directly manifests the Divine Qualities. It is the way that the Creator, Most Merciful, wills and guides His servants to be. Such a person, a true Sheikh who, following the example of the prophets (as), is an agent for the manifestation of God’s mercy on earth, will go out in search of those who are hungry and needy if they have not already lined up at his door, seeking food and help. He (or she) will spend sleepless nights praying and seeking divine guidance for everyone that is linked to him in any way, everyone he will ever know, as well as those that he does not know. He will be continuously engaged in serving others, taking care of their needson every level, never waiting to be, himself, served. This is the way a true Sheikh functions, and all those who follow him sincerely, all those who are being trained by him, become like this also. Wherever such a Sheikh is, that house, that mosque, that corner (zawiyyah) of the universe will become a refuge for all, a placeof profound healing in the remembrance (zikr) and supplication of Allah, open twenty-four hours a day, every day. In this contemporary world, in which most mosques, churches,and synagogues are closed most of the time, this example of a place of refuge, healing, solace, nourishment, and continuous guidance precisely follows the pattern of the mosque built by the Prophet (saw) and his Companions (as) in Medina, which was a sanctuary, clinic,and place of continual teaching and illumination for the believers. The Prophet Muhammad (saw), except when he retired to a cave for a periods of profound isolation and prayer, was always in the presence of his companions (ra), always teaching them, always sharing with them. The proof of this is in the vast number of ahadith that were written down by those who lived with him day and night. A true Sheikh, who profoundly adheres to the sunnah established by the Prophet (saw), will, following his example, live and interact in deep spiritual intimacy with his companions, always aware of what they are going through and how to help them progress on the journey. The true Sheikh, one who is carrying an unbroken chain of transmission, which he is empowered to give to the sincere disciple, perceives every disciple with x-ray vision. He sees what no one sees and feels what no one feels, and his love, which is divinely inspired, is thus powerfully transformative. What may appear, to others, to be an abandoned lot, filled with weeds and even piles of trash, is, to him who sees its potential (what it can become), a fertile, bounteous garden filled with rare and beautiful flowers full of fragrance. He sees the potential in every seed, which is lying dormant in the ground. And he has been entrusted with the life-giving water, which he pours upon the seeds, so that, one by one, they push through the soil, and, moment to moment, reveal the inherent beauty and fragrance, which each one possesses. No ordinary love is this, but love, which knows about us what we know not, loving, and thus bringing to life, ever-deeper dimensions of our being - our spiritual potential - of which we were not even aware. These are the seeds planted within us by our Creator when He created us.He placed within us secrets and mysteries, which only a person of wisdom can see and make us know. These are the Divine Names which link us to our Lord, and when we know them, show us the way that He has decreed for us to return to Him as directly as possible. May every soul that is filled with longing to realize its true purpose be guided on a path that unlocks and activates these divine mysteries. Connected to the physical body, but not limited by it, is our spiritual being that only a person of God can see. And this is what the Sheikh enables us, ourselves, to see on the inner journey, as veil after veil is penetrated. As we are purified and illuminated, we draw closer to our Lord, less and less obscured by the veils of the world and all that it contains, closer to realizing and fulfilling the purpose for which God created us. In one after another of the inner journeys we are blessed to make, the Sheikh is inspired to know what words of the Holy Qur’an we are ready to read, behold and assimilate. It is a feast that he is serving us in the depth of our solitude, of divine knowledge,that we assimilate and absorb. No food that we have ever eaten is like this food. This food is the light of Allah, and by eating it we become light. Every divine word, every teaching that we assimilate illuminates our journey within. And thus, on the inner journey, we come to realize that we, in our true nature, are composed of these beautiful words, the messages of our Lord, which are, one by one, being revealed to us and also bringing us back to Him. Such is the medicine given to us in perfect doses to heal and transform everything within us, which has throughout our journey, blocked our progress and caused us to be separated from the pure Love, the Majesty and Bounty of our Beloved Lord. This is the divine therapy. The Sheikh is the vehicle, the agent for the grace of Allah (subhana wa ta’ala) and His Messenger (saw). So he does not give, but the Most Merciful God, in His infinite generosity and love gives, through the agency of the Sheikh’s guidance, whatever are the secrets of the knowledge that we are blessed to receive at every stage of our journey. After all the conveyances, all the trains and planes, boats, buses and cars, I had traveled in on the journey in search of the Creator and the path that leads to Him, now I was being transported by His Words, His Revelations coming to life within me. It is said that there are many signs to recognize an authentic guide (a Murshid). From your experience how would you list them, or any particular sign you want seekers to pay attention to? Sheikha: A man or woman of God inspires you to focus not upon him or herself, but upon Allah (swt). To the degree that you are brought closer to Allah (swt) through your interaction with a servant of Allah, you know that you are being rightly guided by an authentic guide. You have traveled across the world, in many countries. Looking at the current condition of people and specially that of Muslims, what makes you the most hopeful? What you feel collectively Muslims must guard against? Sheikha: What is inspiring, enlightening, and hopeful is to see the light and love shining through the hearts and faces of those who are surrendered to Allah (swt) the Lord of Infinite Grace. I have met such beings, shining with the light of grace, throughout my journey, and this was such a beautiful welcome into a way of living that is full of faith and hope. But what do we hope for? Upon what do we depend? In reality, our only hope is in Allah (swt) and in the Straight Path that comes from Him and leads to Him. For His beautiful din to be manifested in the ever-deepening dimensions of Islam, Iman, and Ihsan, this is what inspires and guides us and makes us truly hopeful. Our hope and joy manifest in the affirmation of the Sovereignty of Allah in accordance with the sunnah, the profound example of His Messenger (saw) bringing to completion what all the prophets (a.s.) brought. We believe without doubt that His promise is true and we beseech Him to enable us also to be truthful to the promise (covenant) that we have made to Him. The warning to Muslims, as to all mankind, has also been absolutely clearly revealed. The warnings addressed to all mankind regarding the inevitability and seriousness of the Day of Judgment are especially significant for Muslims because we have read the texts; we have been informed. We know that on that Day, we will see every atom’s weight of good that we did here and also every atom’s weight of evil. We, who are Muslims, have a greater responsibility to realize and manifest the Truth that has been bestowed, entrusted, awakened within us. We have been educated and informed about the choices that we have and the decisions that we must make. Every moment of our life in this world is a sacred opportunity to do good, to be good, charitable, loving and kind, to learn and to teach what Allah (swt) has revealed and to manifest the state of ibadat in all its dimension. By immersing ourselves in the love, worship, and service of the One Most Merciful, inah’Allah, we can overcome the dangers elucidated in the warnings that Allah has sent to humanity. "O My servants ! I have forbidden zulm (oppression) for Myself, and I have made it forbidden amongst you, so do not oppress one another. O My servants, all of you are astray except those whom I have guided, so seek guidance from Me and I shall guide you. O My servants, all of you are hungry except those whom I have fed, so seek food from Me and I shall feed you. O My servants, all of you are naked except those whom I have clothed, so seek clothing from Me and I shall clothe you. O My servants, you commit sins by day and by night, and I forgive all sins, so seek forgiveness from Me and I shall forgive you…." May we, who are Muslims, who have read these powerful words probably many times, take them to heart and manifest them in action so that we may be amongst those who are not oppressors of ourselves or others, but are amongst those who are guided, fed, clothed and forgiven by the Infinite Mercy of Allah (azza wa jalla). In the beginning of your seeking, what was it in Islam or its beauty that pulled you in it the most? Sheikha: What truly pulled and compelled me toward Islam was the magnet that was the Will of Allah, His Power and Beauty and Grace. I was magnetized and overwhelmed by that Reality to bow down in His Presence. This occurred automatically the first time I entered a mosque. I immediately fell prostrate. This was before I consciously knew what took place in masajid. This took place in a beautiful mosque to which I was guided far out in the desert surrounding the holy city of Mashad in Iran. Even before that, I had witnessed an amazing vision of the salat being performed in the desert itself, in the masjid of nature. This revelation occurred in the deserts of Afghanistan. “At last, the train arrived at its final destination in the east in order, to return to the west. That is where I got out. I was in Afghanistan. I began to travel by bus, but not the modern, streamlined buses that we are used to seeing in great numbers in all modern cities. The buses in Afghanistan were, with their plenitude of bells and tassels, hand-painted works of art. Brilliantly colorful and joyous, with no glass in the windows and packed with equally colorful passengers, they were an expression of the culture, the innocent, childlike heart of the people. I remember an ancient stillness and light pervading the land, which was at that time, still untouched and intact. In every city and every village, the people, dressed in beautiful robes, embroidered hats, and turbans, were sitting in circles, communicating, sharing, and drinking coffee or tea. I saw no violence, no festering fires of terrorism, or the bleeding wounds of a country dispossessed or possessed, but a golden haze of stillness and peace. I sensed that the life there was being lived as it had been for centuries. This was holy Afghanistan, where a boy like Jelaluddin Rumi could have been born and begun to grow up. For me, this was a vision, something revealed to me that I needed to see. I do not know how accurately this vision presented the real state of the land and the people that I saw. I am certain that there were many things taking place there, within that complex culture that I was not aware of. I saw only the dimension of ancient and eternal peace, and I did not want to leave it. The memory of this holy time and place is poignantly precious to me now, since all things have been changed by the ravages of the times of destruction. 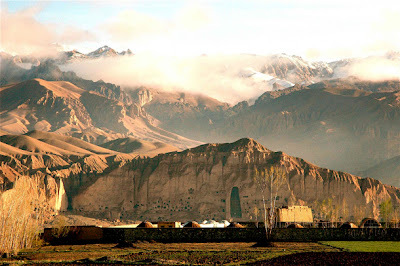 The beautiful, golden, gentle, peaceful land of Afghanistan I saw then cannot be found again in this world, but it lives in the hearts of those who were blessed to perceive and internalize the beauty and grace of the Eternal One that was manifested in Afghanistan then. What was that mystery which I was blessed to behold, to taste and to smell? Longing to return to that place, I have come to realize that it no longer exists. Nothing in this world is permanent, I know so deeply that I had to move on, and could never go back. When we realize that our true identity is as a seeker, a wayfarer on the path of God, we come to see more and more deeply that it is the path to which we are wed, the path to which we always return, and the path never lets us dwell in any oasis too long. However beautiful and enchanting any experience was, along the way, I could never remain there, but simply take the essence of each experience, the teaching, and continue to be carried along. Now, I was continuing the journey on a bus with bells, beads,and tassels, rattling along as it bounced through the rocky terrain. The bus was wondrous, I discovered, in more than its appearance. I was amazed to see that suddenly, in the middle of the desert, the bus stopped, and all of the passengers got out and laid out their prayer mats in the desert to pray. This occurred on all the buses in Afghanistan at every time of prayer. The call to prayer would come lilting from a minaret somewhere in the desert, and all the people on the bus would get off the bus, lay out their prayer mats in the desert, and pray. I had never seen anything like this. It was a wonderful, amazing vision, outside of any political context, a vision of peace and piety, of people united in their love for the Creator. Wherever the people were going, whenever they had to get there, the priority and necessity for them was always to stop in the middle of the journey at the designated times, get off the bus and pray. This was the way in which I was introduced to the simple beauty and truth of prayer and of Islam. This act of bowing down, of stopping in the middle of any journey to praise the Creator, was not something I learned about in a book - it was a reality that my soul witnessed. It was an awakening for the soul, an invitation to pray. The way that such images are presented today by the media suggests that when you see a group of people gathering together to pray in the Islamic congregational prayer, you should be afraid, for when they rise up from their prayers these people may do something violent which will endanger you. But what I saw in the middle of the desert was the very opposite - absolutely peaceful, natural, and pure. It was for me a revelation of pure existence, in which human beings traveling upon the earth given for them to dwell upon by the Creator bow down upon it in praise of Him, as He has decreed. What has been decreed, by the Creator, I came to understand, in my discovery of the beauty of Islam, is mercy and kindness and peace, which come through submission and surrender to the Source of all things, the Most Merciful, Most Compassionate. The true believers bow down to praise the greatness and the glory of the One who created everyone, and the root of the word “Islam” is salam - peace. This is the truth of submission to the Creator of all, Most Merciful, Most Compassionate, Most Clement, Most Kind. It is a truth, which is hidden in our world, today, behind a terrible veil of war, brutality, injustice, and strife. But what was revealed to me in that moment in the desert of Afghanistan was a vision of peace, not war, a vision and realization, which has constantly guided my journey toward the Source of eternal peace. Signs are continuously being revealed to us to help us enter the stream of the Divine attributes. For me, that eternal moment, that vision in the desert of Afghanistan was the opening of a doorway of perception that would lead me toward the Source of the stream. So the powerful beauty of the act of submission unfolding in nature in the midst of the vast deserts of Afghanistan was one of the signs that the Creator definitely willed me to behold. 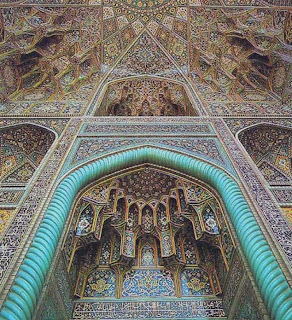 Then, I remember standing outside of a mosque in Mashad when the people were coming out from the prayer. The beauty of the faces of the believers as I witnessed them pouring out of the mosque after prayers, so filled with light, was also a compelling sign and invitation. The kindness and generosity of Muslims in every country where I met them, the outspread table (al maidah) to which I was welcomed everywhere, filled with food of love, sustenance, and knowledge of the Divine – this outspread table, to which I was continuously welcomed also magnetized me to take my seat in the divine assembly. In terms of service to the creation, what is your favorite and how do you approach it? Sheikha: By giving what we have received, the circle is completed. We must feed as we have been fed and nurture as we have been nurtured, transmit what has been transmitted – these are the signs that the transmission is living and real. 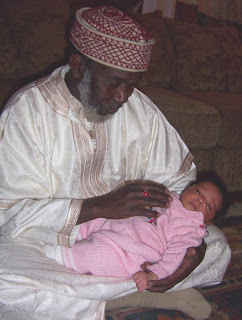 From the moment that the light of Islam dawned within me, I have been sharing it – sharing and caring. Right now I am teaching a class of about 20 extraordinary children. Part of the class consists of sharing or transmitting knowledge from the Qur’an, and ahadith, and part of the class is inspiring the children to express their understanding of these deep teachings – to express how the teachings are coming to life within them. The teachings must come to life within the hearts of the students. This kind of teaching is not academic, but an actual awakening. Just as the exalted ones that I was blessed to meet awakened, by the Grace of Allah, this consciousness within me, it is my duty and commitment to pass the blessing on. I am so happy to see the light of understanding, the light of iman dawn within them and am amazed by the innate love-filled wisdom manifested through their hearts and words. There are children in the class whose parents and grandparents I have also been teaching and have taught throughout the years. This is a living intergenerational transmission. We are all enlightened together by the transmission of the knowledge of Allah, as He wills. And He tells us that no knowledge of Him comes to us except that which He wills. So we must realize as knowledge of Him comes to us, it is coming to us, from Him, by His permission and grace. Like this, I am blessed and honored to share with the children, their parents and their grandparents in an ever-expanding circle. When people I have taught so many years earlier appear again, as one wonderful young man did yesterday, and remind me that they first learned their surahs through me, this touches me so deeply – that I may serve the Creator in such a way as to bring to life His words in the hearts of His creations. 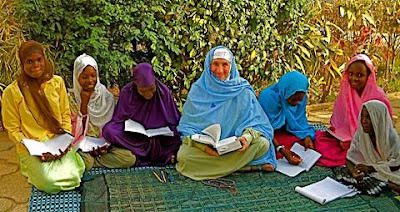 I have also been honored and blessed to teach women in prison – to bring to them – as well as the Qur’an – the light of the sky and clouds, which my sisters in prison cannot see, except through me. What advice would you like to give to those who have come to know about Islam from the media, which often portrays this religion as a violent and oppressive doctrine? How can they get a true picture of Islam that may benefit them in a practical way? Sheikha: The best way for those who are seeking a real understanding and experience of Islam is to meet and share with sincere Muslims. It is we, who are Muslims, who must provide the true beautiful picture, which may be hiding behind the clouds of misrepresentations and misunderstanding. My response to any negative interpretation of Islam presented in the media is to manifest, to the best of my ability, by the grace of Allah, the opposite of the distorted image - which is the beauty and the light. So if the media is putting forth the concept that women in Islam are oppressed, we must, insh’Allah, manifest the reality that Islam has elevated, liberated and empowered us as women. While the media may focus upon the small fringe of misguided terrorists, may we, the vast majority of Muslims, manifest in the various dimensions of our life and interaction that the Holy Prophet (saw) and the din that he brought are mercy for all the worlds. Therefore, when standing on line in the market or helping any one in need in any way that I possibly can, working in both the prison and the marketplace, I have no doubt that my duty is to transmit love, mercy, and light. Certainly I do speak in the media whenever invited, and in conferences around the country and the world, bearing witness to the light of Muhammad (saw), which is sustaining and shining through all who truly invoke him, and I believe that our faith, understanding and knowledge must manifest, by God’s grace, not only in our words, but in all our intentions and actions, in all the dimensions of our life. This being our responsibility, I would encourage people seeking knowledge and understanding to explore the worlds ( which may now be closer to you then you think ), in the pursuit of real experience. Growing up in Hollywood, the San Fernando Valley, and then even Berkeley, California, I had no actual experience of Islam. But having received the definitive message: “SEEK, AND THE TRUTH SHALL MAKE YOU FREE” I set out on the amazing quest, which led me to the experience of the light and beauty of Islam in so many places and ways. I have met so many wise and gracious beings of all ages, nationalities, and walks of life, all manifesting the beauty and grace, kindness and mercy, wisdom and knowledge of Islam in their own ways. And it was in this way, not simply by reading about it, that I learned about the truth of Islam in contrast to what is often shown in the news. This is one real reason that we need to go into the world and share love and light with the people we meet. I have just spent a month vending in an international marketplace in the center of Philadelphia, seven days a week. It was held in a place accurately named “Love Park.” How many beautiful luminous faces I beheld as we exchanged goods, understanding and knowledge. 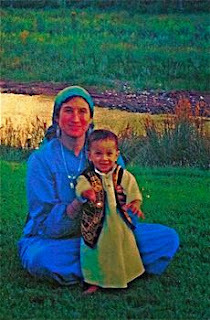 My business is called: Kashmir Dream, Treasures from the Silk Road. This refers to land and sea routes from the Red Sea to East Africa, India, China, and Southeast Asia, upon which people from different parts of the world met, and exchanged goods as well as knowledge. The mystic meetings of the past month were taking place not in Turkestan or Kashmir, Mongolia or India, but in Center City, Philadelphia – not in the twelfth but in the twenty first century. So, here and now, I recommend to people seeking knowledge of Islam that is not being reported on the news to keep open the eyes of your heart and seek knowledge through connection with Muslims, and especially Sufi Muslims if you would like to gain knowledge and experience of Islam that is not being presented on the news. Already those who have arrived at this website Technology of the Heart, are on the right track. If you read or hear words that resonate with your innermost truth keeper – go for it! Make contact! The doors are open: Walk through. Come and sit down at the table with us and partake of the feast. That is the way to taste and experience the reality of Islam, often light years away from the image that is often portrayed by the people of the media, who, themselves may not yet have encountered the beautiful truth. + You may connect to Sheikha Maryam Kabeer Faye through her Facebook Page or you could reach her via email, barakah@verizon.net.